Consistent with data from the 2002 NHIS study, CAM use by adults in 2007 was more prevalent among women; adults age 30 to 69; those with higher education level, not poor, or living in the West; former smokers; and those hospitalized in the prior year (Barnes, 2008). CAM use was positively associated with number of health conditions and number of physician visits in the previous year. When concerned about cost or inability to pay for conventional care, adults were more likely to use CAM. For children, the 2007 data show no gender difference. For all therapies combined, CAM use was highest among adolescents age 12 to 17 years (16%) versus children age 5 to 11 years (11%) or preschool children age 0 to 4 years (8%). Children's use of CAM increased as their parents' education or income level increased, and when families were unable to afford conventional medical care. Children with a parent or other relative who used CAM were about five times as likely (23%) to use CAM as children whose parent did not (5%). Figure 11-4 shows the disease or condition for which adults and children are most likely to seek CAM. The 2002 survey also addressed the important question: Why do people use CAM? Previous studies revealed general issues of the overuse of technology and a reductionist approach to care, managed-care time constraints limiting visits and eroding the physician-patient relationship, and the explosion of Internet-based information on CAM. 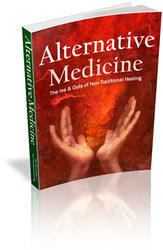 Astin (1998) found that along with being more educated and reporting poor health status, most alternative medicine users were not dissatisfied with conventional medicine, but rather found these health care alternatives to be more congruent with their own values, beliefs, and philosophic orientations toward health and life. Only 4.4% reported relying primarily on CAM therapies for their health care. A subsequent study of patients using both CAM and conventional care also found that use of CAM did not primarily reflect dissatisfaction with conventional care (Eisenberg et al., 2001). Reasons for CAM use reported in the 2002 NHIS study are shown in Figure 11-5, with slightly more than one half of all respondents believing CAM combined with conventional medicine would be helpful. Figure 11-2 Complementary and alternative medicine (CAM) use by U.S. adults (2002, 2007) and Children (2007).